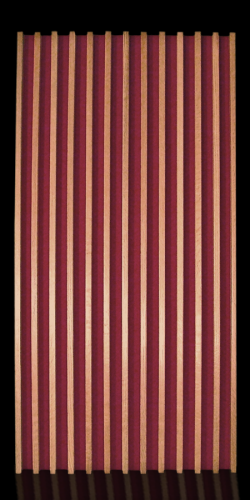 The Quiet Louver™ is a high density 6-7 PCF glass fiber panel covered with Guilford of Maine FR701 fabric overlaid with wood louvers, attached directly to the panel. These custom-made Quiet Louvers are appropriate anywhere sound absorption is required and the warmth of wood is desired. When installed side by side, the louvers overlap the seams of the acoustical panels leaving the finished installation with a clean monolithic look. No joints are visible. Wood Louvers are available in Red Oak, Aspen, Maple, Ash and others. Stains for wood louvers are available in Fruitwood, Walnut and Mahogany. 24" x 48" x 2.25"
24" x 96" x 2.25"